When this series began the focus was on the nursing practice that Cherry Ames did. 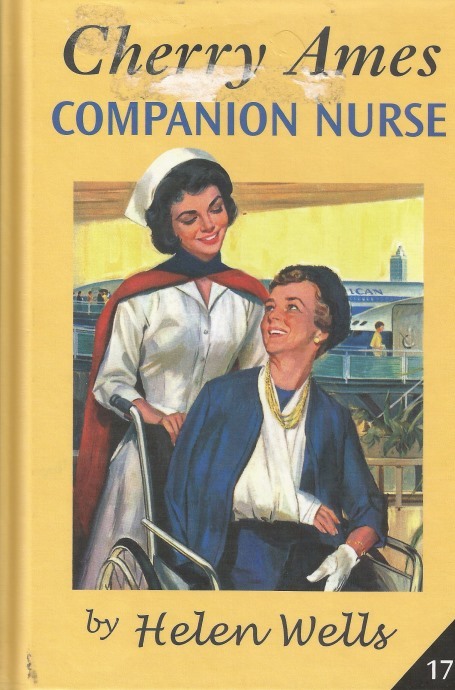 Then the focus changed in later books to a major emphasis on a mystery and a minor emphasis on the actual nursing duties and that changed the entire nature of the books. At that point the books became pretty much generic mystery books ala Nancy Drew. The problem is that the mysteries almost never have anything actually doing with the nursing and that the villains are way to easily figured out, basically as soon as their characters appear and that's the way this book is. Nancy is taking care of a woman after a fall. They will go to England to observe art galleries and as soon as they are on the plane one of the main villains appears. It's terribly obvious he is the villain. We pick up a second villain later and, likewise, once he appears it's obvious he is villain #2. The them is the villains stealing paintings from collections that Cherry and her charge have gone to see. Too much "coincidence" and further proof who the thieves are. I think they should have stopped the series when it was at its height rather than turning it into the standard but not well done mystery novel.